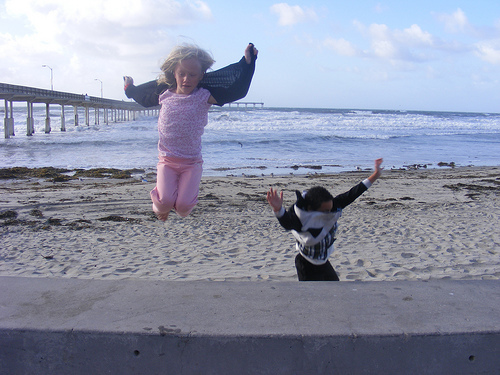 "no no no theyre like flying up!" Ulm Pishkun is the largest known "buffalo jump," about one mile (1.6 km) wide. At a time when buffalo (bison) were migrating, Indians would stampede the animals over the cliff, usually at least 30 ft (10 m) high. The bison were then easy to kill. The fall would cause many to break their legs. 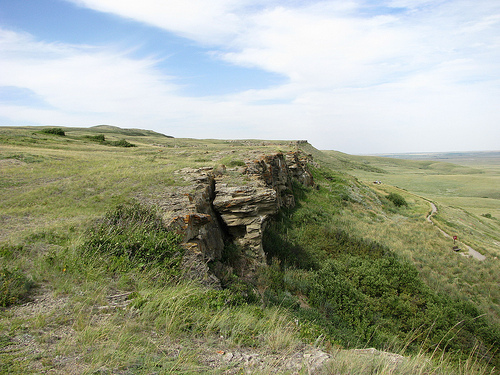 Ulm Pishkun State Park (now called First Peoples Buffalo Jump S.P.) is about 10 miles (16 km) west of Great Falls, Montana. The Blackfoot Indians were the main tribe in the area. This photo is geotagged. Indians used just about every part of the bison – meat, hides for tepees and clothing (including mocassins), bones for implements, fat for soap, certain internal organs as containers, even manure for heat. Some people credit Indians as environmentalily concerned. While the buffalo jump was an efficient way of killing bison, it was also wasteful, suggesting otherwise. 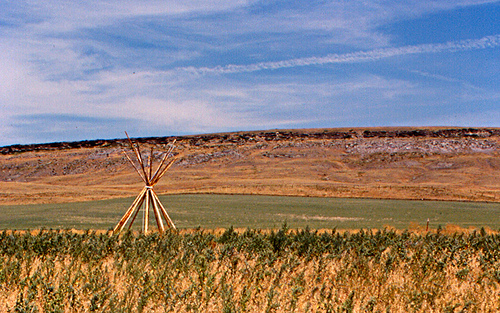 The framework for a tepee is in the foreground.